Apple announces new hardware and software updates which will allow developers and content creators to work in VR on their Macs. 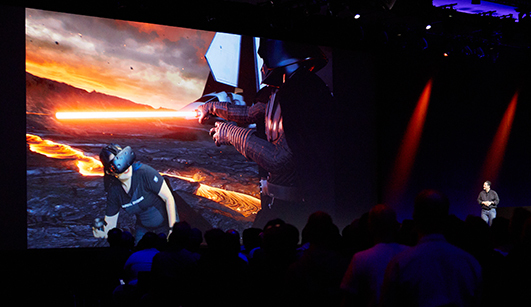 ILM Chief Creative Officer John Knoll took the stage at Apple’s Worldwide Developer Conference to share a cutting edge VR demonstration created by ILMxLAB and Epic Games utilizing Unreal Engine running on the newly-announced iMac computer. The demo showcased how realtime VR tools such as Unreal Engine running on powerful hardware are being used to enhance visual development in filmmaking. Products such as the new iMac and iOS 11 will no doubt enable ILMxLAB to share incredible experiences with hundreds of millions of people around the world and that’s really exciting.